It’s late. Very late. Like so late that it’s almost time to get up again. That’s convention life for you, though. And thus, day 2 in pictures (I’ll elaborate later!). The day began in the dealer exhibition room. I beelined straight to Stronghold Games‘ booth, met Stephen Buonocore, and promptly purchased Confusion: Espionage and Deception in the Cold War. Yes, it is mine. Yes, it is beautiful. 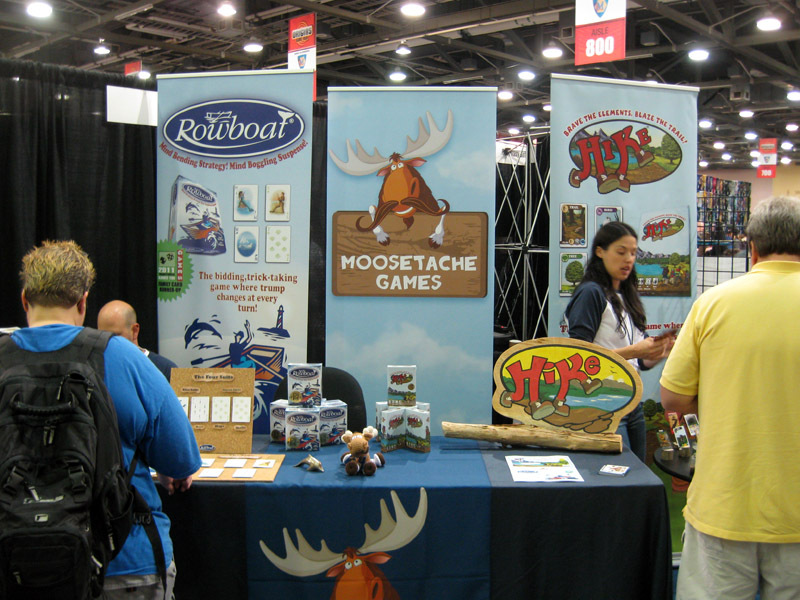 Next up: Meeting Cristina Ramos at the Moosetache Games booth, and getting a look at their new game, Hike. We love Rowboat; it looks like we’ll love this one, too. I’ve been promised a demo game tomorrow, so I’ll have thoughts on it later. 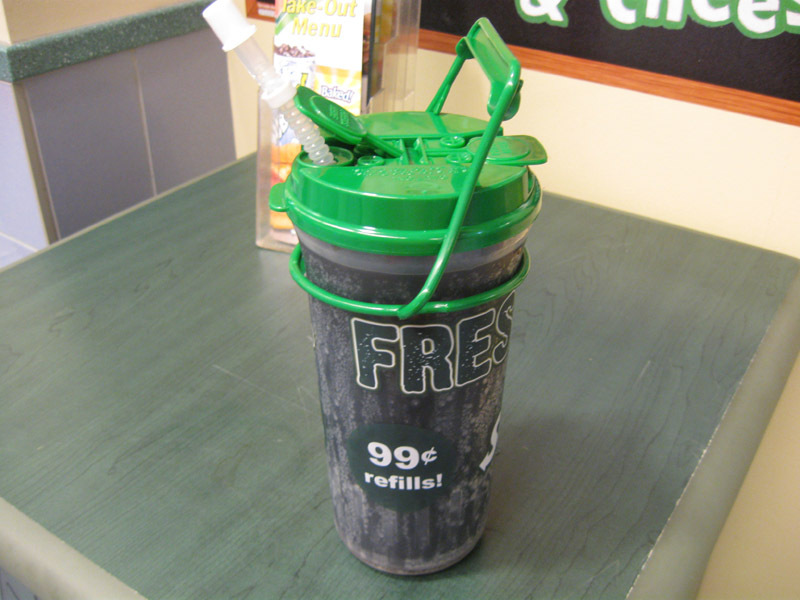 It was time to fill up the bucket before heading to the open gaming area for demos. This is required equipment at Origins. Yes, that is Defenders of the Realm. Yes, that is designer Richard Launius teaching us how to slay some minions. Yes, it was totally awesome. And, yes, we totally won. I want this game. And Richard is one of the nicest, most exuberant designers I have met to date. He really loves what he does, he loves his games, and his enthusiasm is overly infectious. I’d play anything with the guy. Hey, giant Word on the Street. Coooool. Had lunch at Barley’s again with some of Richard Launius’s playtesting buddies from Atlanta. We ended up breaking out mine and Monkey238′s game prototype in the middle of the bar. Everyone had a blast. It all just feels so right. I think we really have something here. 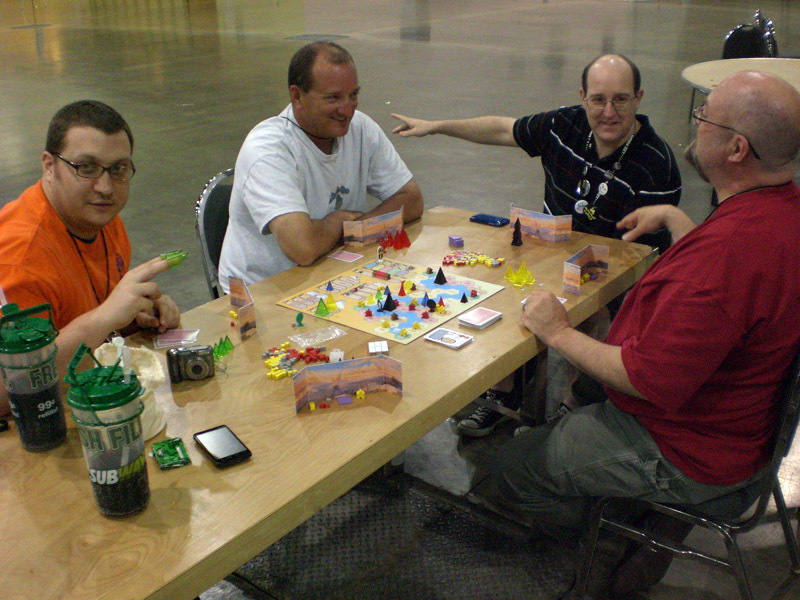 After more shopping and dropping off the bag full of games that was breaking my arm, Shawn and I returned to the open gaming area and tried out a super crappy game by Reiner Knizia that shall remain nameless before it was time to meet Philip duBarry for some gaming. Needless to say we will not be playing said Knizia game again. Ever. Philip duBarry welcomed us graciously, and invited us to try his newest game, currently on Kickstarter, Kingdom of Solomon. 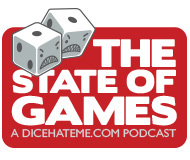 Some of you may remember the mention of Kingdom of Solomon on The State of Games podcast, Episode 9. Dear readers, I am here to tell you that it is for real. It’s a solid worker placement Euro with a wide array of interesting choices, and a really good, smooth feel. The game lasted about an hour, and it was the perfect amount of time for a game of its weight. I would highly recommend it, and I really want a copy for me and Monkey238 to play at home. It’s that good. Don't trust that mild-mannered exterior. At all. Ever since Revolution! came out a few years ago, I’ve been wanting to play. Well, I finally got my chance when Philip duBarry made good on his promise to play it with me at Origins. It was worth the wait, and despite the total walloping I received from the five other players, I enjoyed it immensely. 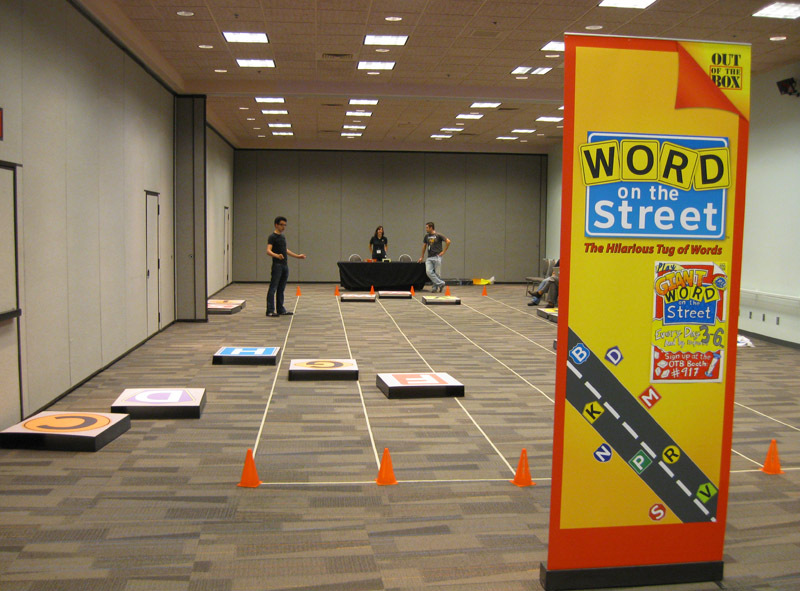 I’d really like to pick up a copy for the lunchgames group – this mindtrip of a game is totally in their wheelhouse. A clean Egypt, as Pharaoh's barge sets sail. 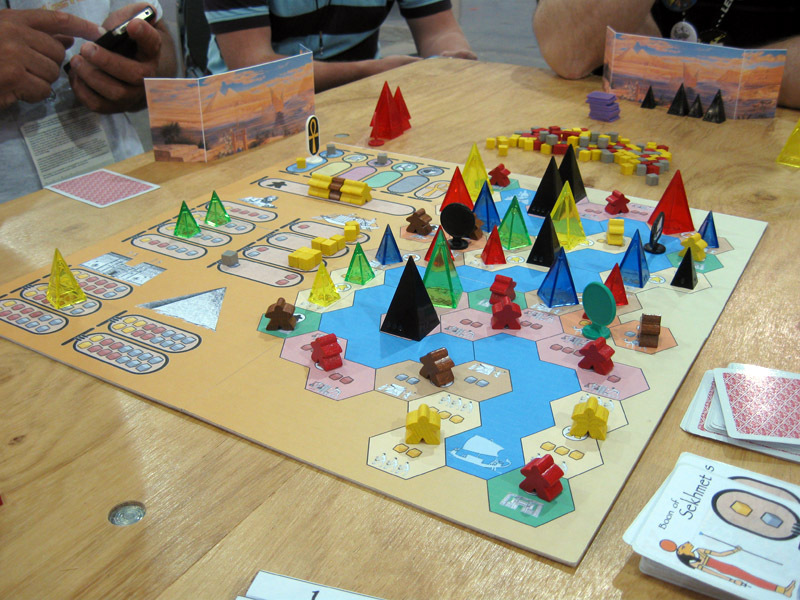 We rounded out the evening with John Moller from Cartrunk Entertainment joining me, Shawn, and David & Fred MacKenzie in a prototype session of David’s newest game, Sailing Toward Osiris. We discovered a few kinks to work out, but overall the play was a lot of fun, with a very different feel for a worker placement/resource management game. 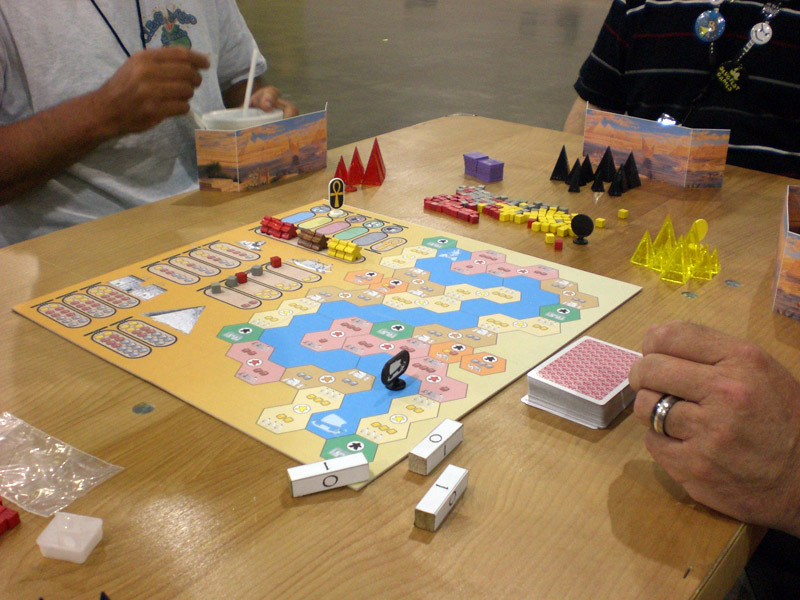 The sailing of Pharoah’s funeral barge up the Nile lends a dreamy quality to the somewhat-hectic banter that goes on while players haggle for resources, special cards and even glory points. I think this game has promise, and I look forward to helping out as best I can and seeing how it grows and develops. Look at these jokers, dirtying up Egypt. Endgame, as Pharaoh reaches Osiris. Ooh, pretty. Lastly, John Moller roped me and Shawn into a round of his prototype card swap memory game, Family Reunion. Although he kept us up to ungodly hours, it was totally worth it. The play was smooth and fairly fast, and the dynamic was fairly unique. I look forward to seeing where John takes this little gem. And that’s it for me and Day 2 – I’ll be back soon with more photos, tales of playing great games, and, hopefully, interviews. But now, time for bed! I think we’re gonna have to dedicate an entire wall of shelving for…you know. Games. I both fear and look forward to seeing what you bring home! He is bringing me Alien Frontiers Thanks to Clever Mojo Games! And special thanks to Chris (Dice Hate Me) for lugging it back to NC!!!! Also, dude…I so wish I was there…those games look awesome! Thank you for getting Confusion. Ever since I interviewed Kevin of Stronghold (tomgurg.wordpress.com for the interview) I have wanted to get Confusion. Dice Tower did a brief review recently and sold me on it. I cannot wait to play it. 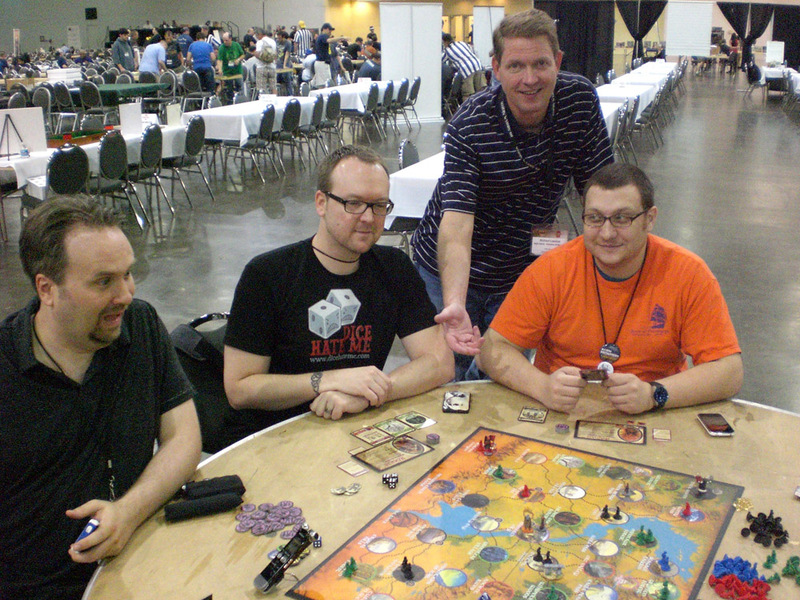 Chris N. has Defenders of the Realms. Maybe it would warrant a special game day for it and Descent? Both the Solomon and Osiris games look great. I’m excited about them both. But I’m more excited about your game. It sounds like you’ve got something there. I really want to play it Tuesday night. Looking forward to Day 3. So want to know that Knizia game! Day 2 is a little closer to what I invisioned Origins to be like. Remember, naps are you friend. Don’t get burned out before the weekend! Monkey – Honestly, I haven’t picked up a ton of new games… yet. But there’s still time! Shawn – Yes, now you can relax and stop hounding us. 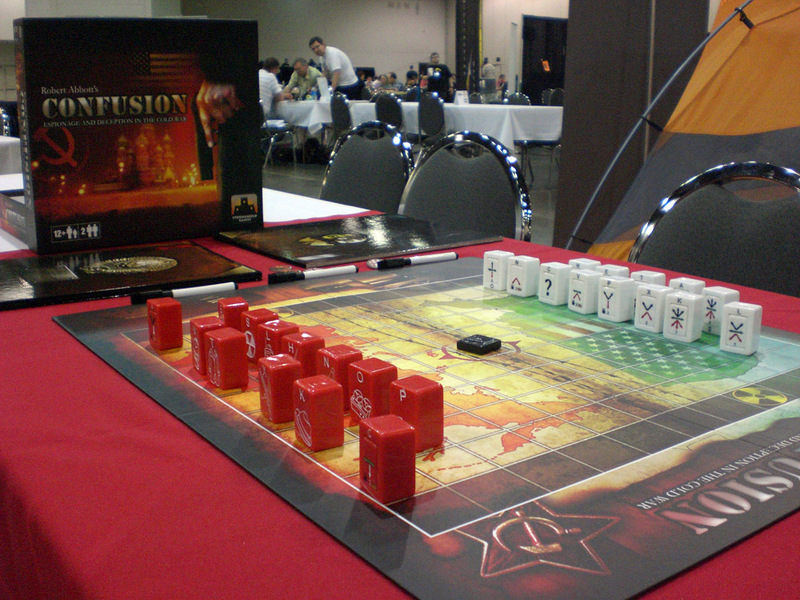 Tom – It would be pretty cool to have a dungeon game day. And I’m looking forward to you playing our game, too! Ian – Oooh, I want a nap now. I’ll send you the name of the Knizia game when I get back so you can avoid it. hah! I hope the Knizia game wasn’t Star Trek but I fear it was. Thanks for the kind words. I had lots of fun playing! 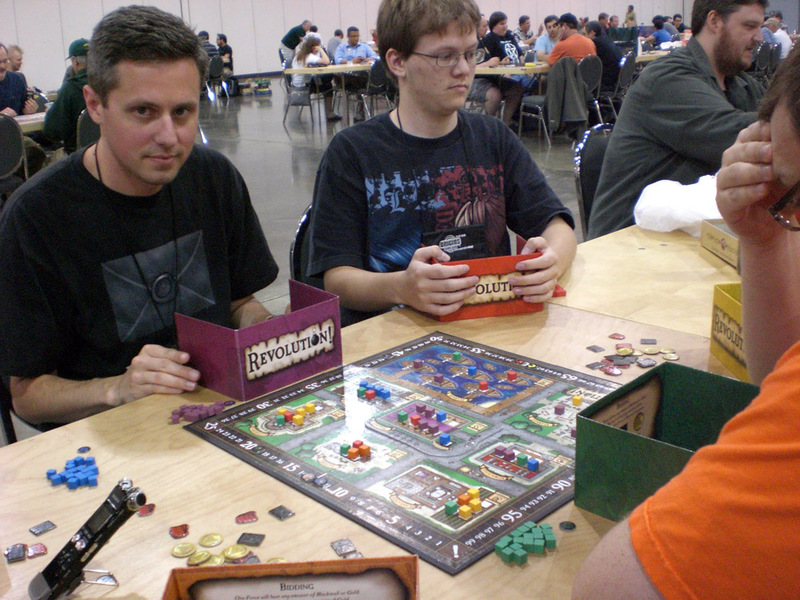 The actual title is: [b]Arkham Game Evaluator Specialist. [/b] It is an incredibly high paying and prestigous position. Jason Maxwell (pictured left) was in fact my valet and major domo. Despite several previous trips to Origins, I had never stopped by Barleys. After our trip over, I couldn’t get enough of the place and ended up going over another three times. 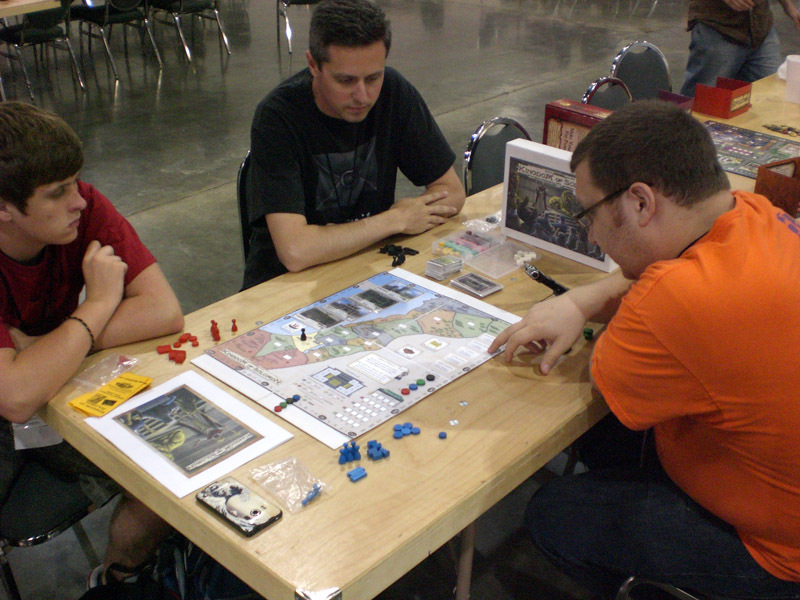 It stands out as the #1 best thing about Origins 2011. However running a close second was hanging out iwth you guys. Definately look me up if you ever get down to Atlanta. BTW that prototype Midway blows. Just kidding- I agree it was a very tight set collecting game with a fun twist. You’re right, it is a solid game. Great website. I’ll have to pop in and pester you guys from time to time. Steve! I’m glad you dropped by – I was just about to track you down. I like that title of yours; I want a fancy title. And a valet. And I told you Barley’s was the best; we ate a late lunch there every single day. I wish we could’ve caught you on your big night – that could’ve been a fun way to say aloha to Origins. I will definitely give you a shout if we’re down in Atlanta. I think you said you guys are going to DragonCon – if we decide to make the trip, we’ll have to get together, for sure. I appreciate the compliments on Carnival. Thanks for playing and making it a fun time. Just as with any game, it’s only as fun as the people you play with, and sharing a table with you was awesome. Stop by any time – we’re open 24-7.